Google is firing on all cylinders at Google I/O 2012. They’ve announced a new, much improved version of Android – Android 4.1 Jelly Bean, an accompanying Nexus tablet that’s getting rave reviews, new and updated Google apps and services and, more recently, Google Chrome for iOS devices. 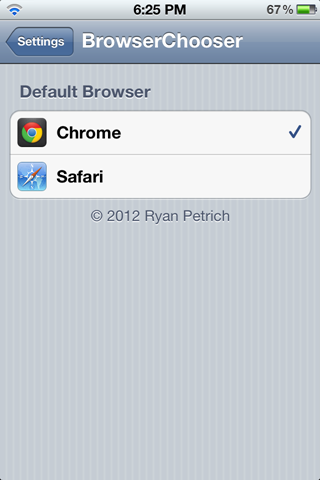 We’ve discussed Google Chrome for iOS’s features in detail in a separate post. It brings over nearly all of Chrome for Android’s features such as the awesome user-interface, syncing with Google Account, Incognito Mode etc. etc. but without the fast V8 engine or the ability to set Chrome as default browser, that’s the long and short of it. Now we can’t do anything about the former but we can, thanks to a jailbreak tweak, set Google Chrome as the default browser on our iOS devices. The tweak – named BrowserChooser – was released earlier today. To get the tweak on your device, you have to add Ryan Petrich’s repo rpetri.ch/repo to Cydia from Manage > Sources > Edit > Add. Then you just search for BrowserChooser and install the free tweak, it’s really that simple. This puts a menu under Settings app from where you can select the browser you want to set as default, which in this case you’ll be setting Chrome. 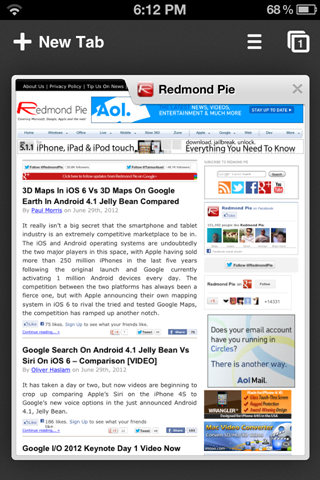 BrowserChooser supports Chrome, Opera Mni, iCab Mobile, Dolphin Browser and Atomic Browser. We’ve tested the tweak on an iPhone 4S jailbroken on iOS 5.1.1 and can confirm that it works as advertised. We tried opening Safari from a wide variety of apps but it always opened up Google Chrome instead, showering us with epic win every time! And like we mentioned before, you need to be jailbroken in order to take advantage of this tweak, therefore those who aren’t jailbroken are pretty much out of luck here. We wish Apple would let users choose a default browser and an email app, this is something which many users – me included – are looking forward to for a long, long time. With pressure from users, and thanks to a popular browser like Chrome, we think it won’t be long until Apple gives users the option in question.